One Lucky Duck San Antonio - One Lucky Duck is one of my favorite NYC spots, so I was happily surprised to see they had an outpost in San Antonio. Why San Antonio? 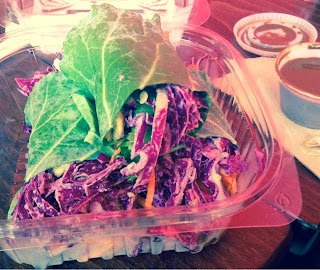 One Lucky Duck's owner's brother lives in SA and thought the city could use a raw, vegan joint. I think he was right - I chatted with the employees and they said that the place was doing well, especially considering it is the only raw, vegan restaurant in town. The food offerings are more limited than the NYC location, and everything is pre-made (i.e. 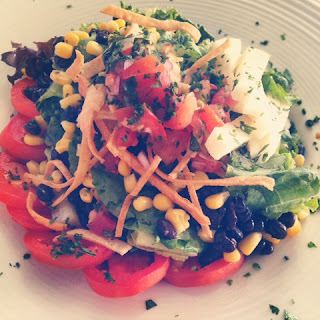 no customized or made to order salads), however everything was still tasty! I tried the Spicy Thai Lettuce Wraps, the Caesar Salad, and the (new!) raw brownie. 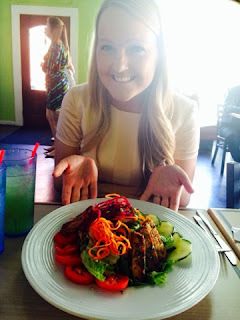 The lettuce wraps were my favorite - sweet mango and crunchy raw veggies paired with a spicy dipping sauce. 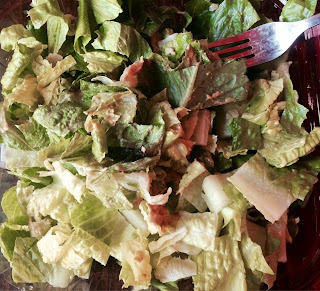 The Caesar was good, but not as hearty of a salad as those I have had previously at the One Lucky Duck in NYC. The brownie was different from your typical "raw" dessert - it was dehydrated so instead of tasting like a Larabar, it had a crunchy exterior and tasted baked. I'm definitely a fan! 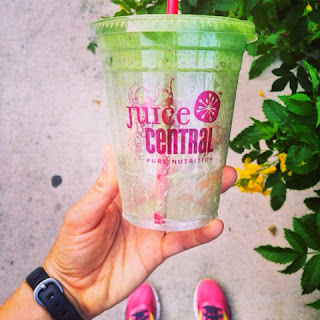 Juice Central- I stumbled upon this spot during my morning run on Tuesday, and boy am I glad I did. Delicious, fresh juices for a reasonable price? I'm all in. I tried a few of the juices: Energize (jicama, pineapple, and pear), Sweet Green (kale, cucumber, apple, pear, lemon), Metabolism Booster (chard, spinach, cucumber, mint, pineapple, lime), and the Spicy Green (kale, spinach, apple, orange, lemon, jalapeno). The Spicy Green was definitely my favorite! Sweet and tart from the green apple with a slight hit of spice from the jalapeno, this was a perfect morning wake up for my body! My team also had lunch here one day, which was a super great deal - $10 for a juice or smoothie and a salad. I definitely recommend this spot for anyone looking for a super delicious and affordable juice. Senior Veggie - A new vegan restaurant in Southtown, Senior Veggie was a hit with my whole team (vegetarians and meat-eaters alike!). Hearty portions of yummy vegan food left us all satisfied, but not sleepy, as is often the case when eating out for lunch. I had the Southwestern Cobb Salad plus a side of their jackfruit carnitas - ridiculously good. Rosarios- We went to this San Antonio favorite for dinner one evening. 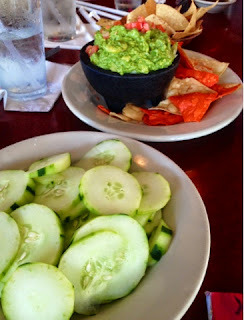 While not particularly vegan-friendly, our waiter was incredibly accommodating and worked with the kitchen to get me a margarita sans simple syrup (so good), cucumber slices for our guacamole and salsa, and veggie fajitas. Unfortunately, I found out after consuming a good portion of the guacamole that it contained dairy. Eeek. While this was disappointing, overall the meal was good and the service above average. 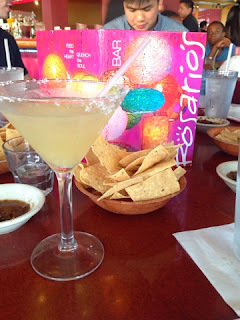 Margarita - sans simple syrup! 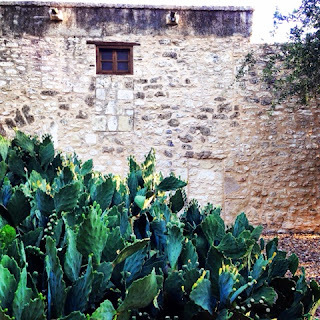 The Alamo - A must-see if you are in San Antonio due to its history. I was a little underwhelmed (I guess I expected it to be bigger), but it was nice to walk through. Plus side is that it is free and open until 7PM. Riverwalk- We stayed right on San Antonio's Riverwalk, essentially a boardwalk filled with shops and restaurants along the river. A great place to walk through, or to have drinks and dinner. 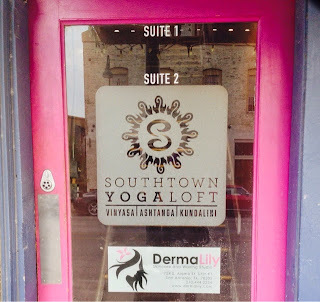 Southtown Yoga Loft- I had a lovely experience at Cassandra's Strong Flow class at Southtown Yoga Loft. My only regret is that I didn't make it here until my last night in SA! A beautiful space, a powerful and fun practice, and a friendly group of individuals - if I'm ever back in SA, you bet I'll be here again! 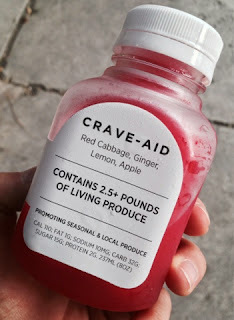 Bonus: they sell cute yoga clothes and tasty juices from Crave. As usual, this trip was for work so I did not get to pick the hotel but I'll put in my two cents anyways. The Marriot Rivercenter is located minutes from the Alamo and, as I mentioned previously, right on the San Antonio Riverwalk. My room was clean and comfortable. The gym was average sized- a special touch I liked was the eucalyptus scented towels. There was both an indoor and outdoor pool, a great way to beat the Texas heat. 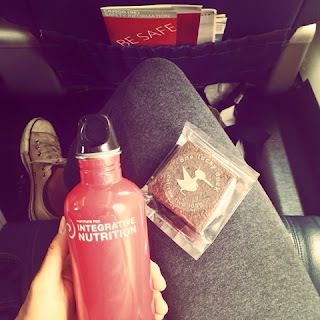 As had been my experience with most Marriot properties, the staff was incredibly helpful and nice (one employee working in the concierge lounge even offered to take me as his guest to his gym for a yoga class when he saw me carrying around my mat). For such a short trip, I felt like I did get to experience quite a bit of the city. While I'm not sure when I will be in San Antonio again, I'm excited to explore Texas more (Dallas this time) in a few weeks. Next stop - Kittery Point, Maine for a week of relaxation with the fam.